Six years have passed since the end of Sister, Missing and Madison is now a teenager. During a visit to her older sister Lauren, Madison learns that their biological father was an anonymous sperm donor and sets out to track him down. Her search bears fruit sooner than she expects, but is the father she discovers all he seems? As Madison gets drawn into a mysterious investigation involving missing girls and secret hideaways, she finds herself in more and more danger. A tense and thrilling end to the bestselling series, not to be missed! 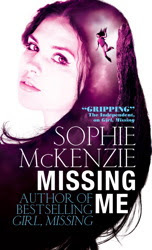 I read "Girl, Missing" and " Sister, Missing" a few years ago and was really excited to read "Missing, Me " . I think I left it too long before reading this book, because there were several holes in my memory when it came to plots and characters, but if you're in the same position that I was in don't worry, McKenzie does a great job subtly filling in the blanks. This book is narrated by Madison, Lauren's little sister, and treads the familiar plot path of bad guys stealing children. The plot is pretty good, not fantastic, but unpredictable enough to keep you on your toes. There was one major " I saw that coming" moment, but maybe that's just me and my need to to predict the plot line of every novel I read. The characters are pretty standard, nothing completely original but pretty realistic. McKenzie's writing flows, and the book is really easy to read, I read it in about two days (when I should have been studying), which is a compliment to the novel. I really enjoyed this book, but I feel as if McKenzie took quite a good idea and stretched it beyond it's limits. But it's not as if she should have finished with the second book, McKenzie managers to make the plot work for a third time. I recommend this novel to anyone who wants a short quick easy read that doesn't ponder any big questions about what it is to be human etc, just a plain old kidnapping/action story.